Our Spring/Summer 2015 line is in my opinion our best yet! This line is inspired by the colors and textures of springtime in India. We have titled the line "Holi" which is a festival celebrated throughout India and many other regions commemorating the arrival of Spring and the passing of Winter. This festival is also known as the "festival of colors". We are incorporating vibrant blue, peach, turquoise and red colors in our custom 2015 fabrics. During the festival, people create Rangoli art. Rangoli is a folk art in which patterns are created on the floor using materials such as colored rice, flour and sand. Using the beautiful rangoli patterns as an inspiration, we created a fabric that resembles their intricate geometrical patterns. Rangoli design we stumbled upon in Union Square, NYC. Along with our Rangoli fabrics, we will be featuring traditional block print and floral print fabrics with a similar color scheme. These fabrics will be great for mixing and matching! A few of our styles will stay true to Nandy & Molly's most popular aesthetic by incorporating hand embroidered detail on tunics and flowing, fun dresses! In our Fall/Winter 2014 collection we are featuring two Ikat fabrics. Ikat is a style of weaving that uses a tie-dye process on either the warp of the weft before the threads are woven to create a pattern. 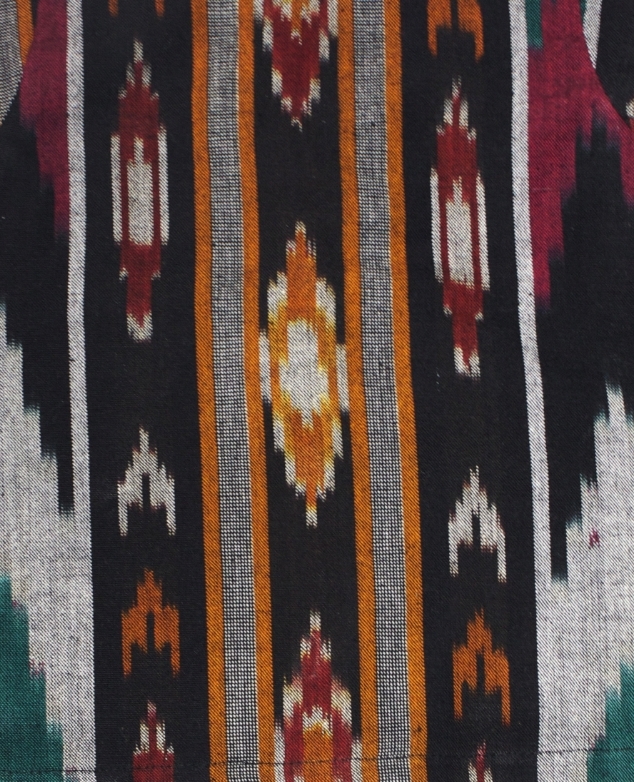 A double ikat is when both the warp and the weft are dyed before weaving. We are featuring one wrap ikat and one double ikat fabric. Our ikat fabric is made by a handloom which is a very skilled, time consuming and intricate craft. We are so happy to have our fabrics custom made by our amazing manufacturer in India. These fabrics make up adorable dresses, skirts and tops for infants up to tweens within our HIMA collection. Nandy & Molly had such a great time at the ENK Children's Club trade show in January! We are thrilled to have gained many new clients. We shared a booth with our dear friend Naaya by Moonlight. She carries beautiful baby and toddler blankets that are hand block printed and hand sewn in India. We were a great pair and had such a blast over the three days! Our 2014 fall/winter collection incorporates inspiration from the women and girls of Kashmir, India. Traditionally, these women wear Phirans, which are long, loose dresses that cover their body. These dresses are designed with colorful flower embroideries that embellish the entire length. Kashmiri girl wearing a Phiran on a Shikara boat. This season we have designed ponchos and coats made of soft wool. These pieces are adorned with similar embroidery styles and colors! We will be at the ENK trade show this weekend to debut. Nandy & Molly's 2014 fall/winter collection, titled "Hima" is inspired by the Himachal Pradesh and Kashmir regions of India. Both are located in the Northern most part of India and have extremely cold winters. Hima is the sanskrit word for snow. It is said that most homes in Himachal own a pit-loom which is used in the handicraft of making woolen shawls. Their traditional shawls are made with striking geometrical patterns and vibrant colors. Himachal woman weaving woolen shawl. The Himachals adorn themselves with Pattus which can be draped over their shawls and pinned at the shoulder. We are so inspired by these bold and colorful pattu prints, you will see them incorporated throughout our 2014 fall and winter collection. The "Hima" collection features woolen ponchos, denim embellished with pattu prints and soft cotton pieces with intricate embroideries. We will be launching the collection at the ENK Children's Club on January 12. Stay tuned for pictures from our photoshoot! Richa recently traveled to Delhi, India to visit her family and our manufacturer. She was able to work hands on in the production of our 2014 Fall/Winter samples. The inspiration in the design of this collection comes from the Kashmir and Himachal Pradesh regions of India where the winters are quite cold. In her fabric search she traveled throughout Delhi, Kanpur, Himachal Pradesh and Lucknow. Once she found the fabrics she worked with our manufacturer in Delhi in the process of constructing our designs. We are so excited to present our line at the ENK children's club show January 12, 13 & 14 at Pier 92 in NYC! We had such a fun experience at the ENK Children's Club trade show in NYC. We made great connections and relationships with our neighbors as well as lovely people in the children's wear community. Stanley Kaye, Children's Club director, was a tremendous help and made our debut smooth and pleasant. We decided to go with a 6x6 space for nandy & molly as it was our first time to sit in a trade show. The space was perfect for our collection! Preparing for the show, we decided to cover the walls with paper and hand paint our logo. Our handmade paper flowers were also an excellent touch. Our booth turned out to be so cute. We got many compliments from people passing by. We were very fortunate to receive our first wholesale purchases at the show! Nandy showing off our Soni top! Richa has an upcoming trip to India for inspiration and sourcing for our Fall/ winter 2014 Designs! We will be blogging and following her travels.